VGlobalTech team is trained and well aware of ADA and WCAG 2.0 Compliance guidelines. We take pride in ensuring that the websites we create are built as per W3C standards in the first place. It is critical for webdesign companies to understand what they are doing before trying to implement web technology. The cheaper websites that look shiny and cool may haunt the customers in the long-term because the foundation of these mom-and-pop website is flaky in the first place!!! ADA and WCAG Compliance is a complex topic and there are several technical details that need to be adhered to. Above all the developers that work on these compliance tasks need to have passion for the work and understand the social value of the compliance. We believe that by making websites compliant we are helping our fellow citizens that have some form of disability that prevents them from utilizing tools that normal users can and need special help in getting value out of the assets and services online. The social responsibility of this task is greater than we can imagine. We are enabling business value realization for everyone that needs it, without obstacles and barriers. In this sense compliance is a noble task in itself. Let us work for you. Let the VGlobalTech team ensure that your online presence is not only compliant but exceeds expectations by delivering value to your users. Please review the assets VGlobalTech team has developed below. Thank you for the opportunity. VGlobalTech’s technical design & development team is fully aware of the Americans with Disability Act (ADA), Web Content Accessibility Guidelines (WCAG), Section 508 of the Rehabilitation Act of 1973 and overall the design principles of a professional, accessible, functional and responsive webdesign. The entire team has taken dedicated time and efforts to learn these design principles first hand. Our purpose is clear – Universal, Creative Webdesign that works for everyone, everywhere and every time! VGlobalTech has partnered with a local agency for the visually impaired – LightHouse Works. 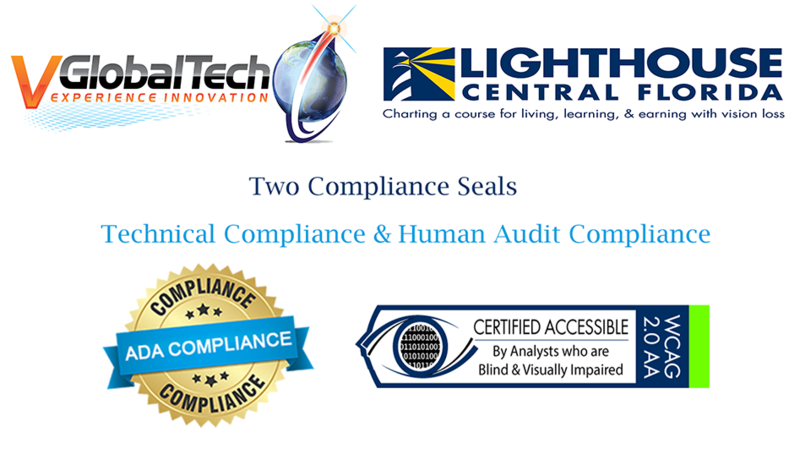 LightHouse has developed a unique program for digital accessibility that is run by visually impaired personnel that are highly skilled in human auditing of websites and software as per the section 508 stipulations. LightHouse represents amazing individuals that are critical part of our community and go above and beyond to help the larger community. We are proud of our partnership and are motivated that we are actually creating social value for our wonderful community. Contact us to get your website compliant today!